Tel: +351 22 55 80094; Fax: +351 22 50 90351. Okara provide compounds of biological interest such as isoflavones and an increase of aglycone content can be obtained through fermentation with food-grade bacteria. This study aimed to evaluate the effect of fructose and fructooligosaccharides (FOS) on the growth of probiotic bacteria in hydrolyzed (by Cynara cardunculus enzymes) okara beverage, as well as on the antioxidant activity, isoflavones and total phenolic content of fermented okara beverage. Okara beverages were fermented using Bifidobacterium animalis ssp. lactis Bb-12 and Lactobacillus rhamnosus R11 alone or as mixture of both, at 37 ºC, until it reached a pH value of 4.5. The growth of lactobacilli and bifidobacteria was evaluated throughout the fermentation, with increases of viable cells ranging from 1.5 to 3 log CFU/mL. Moreover, okara samples supplemented with a carbon source presented a higher growth rate than their non-supplemented counterpart, as expected. In addition, significant differences in aglycone content and antioxidant activity were observed for the okara samples fermented by different species, with the overall content of isoflavone aglycones increasing, the genistein presented the highest increase (ca. 16-fold) in the fermented okara by B. animalis ssp. lactis Bb-12. 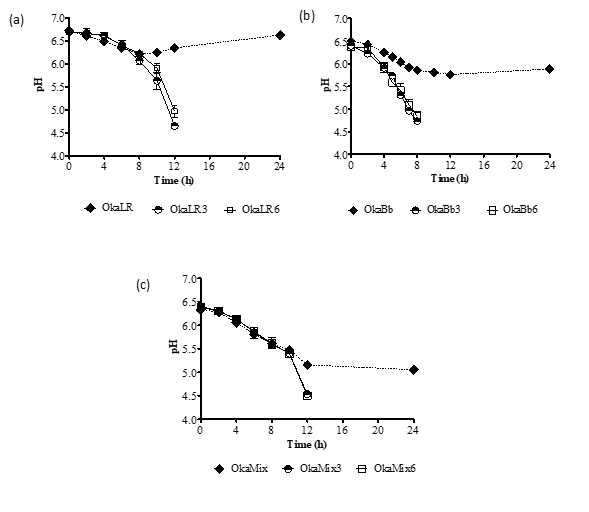 However, the antioxidant capacity was maintained in the okara without carbon source after fermentation by L. rhamnosus R11, while all fermented okara presented a decrease after fermentation process. Considering the hereby reported results, probiotic hydrolyzed fermented okara can be considered a good carrier for probiotic bacteria and a good source of aglycone isoflavones, combining all the other benefits resulting from probiotic metabolism and the hydrolyzed okara itself. Keywords: Fermented Okara; Isoflavones; Antioxidant activity, Probiotic; Fructooligosaccharides. The impact of probiotics (i.e. microorganisms capable of exerting a positive effect upon human or animal health when ingested in adequate amounts) consumption upon human health has been increasingly described in literature, with Bifidobacterium and Lactobacillus strains being the most used probiotic microorganisms, due to their perceived beneficial effects (1–4). On the other hand, prebiotics are nutrients that, while not easily digested by humans, modulate the gut microbiota in a beneficial manner for the host. They differ from most dietary fibers which stimulate the growth of a wide variety of intestinal microorganisms and not necessarily its beneficial constituents (1,2). Among several compounds fructooligosaccharides (FOS) and inulin have been used preferentially in the food market. According to Gibson et al. (2), prebiotics provoke a biased metabolism towards host health promotion rather than being extensively metabolized. Previously, the benefits of probiotics consumption were only associated with milk-based fermented foods. However, factors such as lactose intolerance and milk’s cholesterol content present limitations when considering some consumers' (e.g. lactose intolerant and hypercholesterolemic individuals) dairy probiotic intake (3). Thus, previous studies have focused on the development of non-dairy probiotic or synbiotic foodstuffs using several plant raw materials, among which soy beverages are a prominent example due to their nutritional composition (5). Okara, a by-product of the soy beverage, has also gained prominence in recent years due to its composition and bioactive compounds, with some studies focusing on the incorporation of okara into fermented products (6,7). Nevertheless, the integral use of okara for the development of a fermented product has not been described, to the best of our knowledge, until now. Moreover, previous studies have shown that submitting soy to different process can affect their isoflavone profile and according to Chun et al. (8) and Wei et al. (9) the fermentation with lactic acid bacteria may contribute to increase the isoflavone aglycones. In parallel, fructose has been used as a sweetener in several food products, due to some features, such as the solubility in aqueous solutions and sweetness (ca. 1.7 times sweeter than sucrose) (10). In addition, fructose has been considered a therapeutic adjunct in the diet of diabetic patient, because its initial metabolic step do not require insulin and produces little rise in glycemia (11). It also elicits a more important increase in energy expenditure that has been suggested to be beneficial for obese diabetic and nondiabetic patients (12). This makes fermented soy-based products more interesting as studies have reported that humans can absorb isoflavone aglycones faster than the glycosides and that high isoflavone intakes have been previously associated with lower rates of cardiovascular and cancer diseases, in particular in Asian populations (13–15). Considering the above made arguments, the aim of this study was to investigate the influence of two concentrations of fructose and fructooligosaccharides (FOS) supplementation upon the growth of Lactobacillus rhamnosus R11, Bifidobacterium animalis ssp. lactis Bb-12 and a mixture of both strains and upon specific bioactivities content (isoflavones and phenolic compounds) during the fermentation of hydrolyzed okara. The strains used as probiotics were Bifidobacterium animalis ssp. lactis Bb-12 (Christian Hansen, Hørsholm, Denmark) and Lactobacillus rhamnosus R11 (Lallemand, Montreal, Canada). The aforementioned microorganisms were reactivated and pre-cultures were made in de Man–Rogosa and Sharpe (MRS; Biokar Diagnostics, Beauvais, France) broth, incubated overnight at 37 ºC. For B. animalis ssp. lactis Bb-12 the MRS was supplemented with filter-sterilized L-cysteine·HCl (0.5 g/L; Fluka, Switzerland), and incubated using an anaerobic chamber. The resulting cultures were then used as inoculum for the fermentation. Okara beverage was prepared as follows: 60 g of fresh okara were homogenized with 180 mL of citric acid – sodium citrate buffer (0.1 M, pH 5.2) using a blender under hygienic conditions. Afterwards, enzymatic hydrolysis was performed using Cynara cardunculus extract (Formulab, Maia, Portugal). The hydrolysis was performed in an orbital shaker (SI-100C, Wiggenhauser, Germany) at 55 ºC for 2.5 h using an enzyme: substrate (E/S) ratio of 1.1 (v/w) and under an orbital stirring of 120 rpm. The resulting solutions were autoclaved (1 atm, 121 ºC and 15 minutes) immediately after hydrolysis. Afterwards, fructose and FOS (Orafti® P95) concentrated solutions, both sterile, were added to the hydrolyzed okara, under aseptic conditions to reach final concentration of 3 or 6% (w/v) for fructose and 2% (w/v) for FOS. Each mixture of hydrolyzed okara was inoculated with 1% of bacterial inoculum (as described in 5.3.1) and incubated in an orbital shaker at 37 ºC and 120 rpm to produce the fermented okara (OkaLR, OkaBb and OkaMix). Sampling was performed throughout the fermentation (0, 2, 4, 6. 8.10, 12 and 24 h) that was considered complete when the pH values reached 4.5. A factorial design methodology was performed, encompassing two independent variables: fructose concentration (3 and 6%) and type of inoculum (B. animalis ssp. lactis Bb-12, L. rhamnosus R11 and combination of both). In addition, a control (without fructose and FOS addition) was considered. Furthermore, the growth of bacteria in okara beverages was compared to their behavior when grown in MRS broth. Each experimental condition was performed in duplicate, so in total 24 fermented okara beverages were produced. Potentiometric determination of pH values throughout the fermentation was performed at 20 ºC ± 2 ºC using a pH meter (Micro pH 2002, Crison, Barcelona, Spain). To determine the growth of microorganisms in fermented okara, 1 mL of each sample was blended with 9 mL sterile peptone water 0.1% (Peptone - Sigma Aldrich) and subjected to serial decimal dilutions with the same diluent, plated on using the Miles and Misra method on MRS agar (plain or supplemented with 0.5 gL−1 of cysteine-HCl when B. animalis ssp. lactis Bb-12 was used) and incubated at 37 °C for 24-48 h under anaerobic conditions, using anaerobic chamber (Whitley DG250) (16,17). On each sampling time, throughout the fermentation, a new tube containing okara fermented from the same batch was used for the analysis. Total mesophilic bacteria were determined by plating in Plate Count Agar (PCA; Biokar Diagnostics, Beauvais, France) and incubated aerobically at 30 ºC for 48 h. Yeasts and molds were enumerated in Potato Dextrose Agar (PDA; Biokar Diagnostics, Beauvais, France), incubated aerobically at 30 ºC for 5 d. Inoculation was performed also using the Miles and Misra method (16). Enterobacteriaceae viable count were determined through plating on Violet Red Bile Glucose Agar (VRBGA, Oxoid, Basingstoke, United Kingdom) using the pour plate method and incubated aerobically at 37 ºC for 24 h.
The extracts were prepared according to Fernandes et al. (18), using freeze dried fermented okara, previously degreased with hexane (1:10 w/v) and stirred for 1 h at room temperature. The extraction was performed using 200 mg of sample and 8.0 mL of extraction solvent (water, ethanol and acetone 1:1:1 (v/v/v)). The suspension was left to extract for 1 h at room temperature, with vortexing every 15 min. Afterwards, samples were placed in an ultrasound bath at room temperature for 15 min, centrifuged at 4105 x g for 15 min at 4 ºC and the supernatant was filtered through a 0.45 μm filter (Orange Scientific, Braine-l’Alleud, Belgium) before chromatographic analysis. Isoflavones were analyzed by HPLC using an adaptation of the method described by Wang and Murphy (20). Twenty microliters of each extract were analyzed by HPLC (Waters Series 2695, Milda ford, MA, USA) coupled to a diode array detector, using a Kromasil C-18 column (250 x 4,6 mm) to separate the isoflavones at 25 ºC. The mobile phase consisted of 0.1% acetic acid in water (v/v) (solvent A) and 0.1% acetic acid in acetonitrile (v/v) (solvent B). Elution started with 20% B, increased to 100% B in 20 min and decreased to 20% B in the next 12 min, with a flow rate was 0.8 ml/min. Spectral data were accumulated in the 200–400 nm range and processed using Empower 3 software. Isoflavone quantification was achieved by comparing the absorbance spectrum at 255 nm with that of pure external standards. The standards were dissolved in analytical grade DMSO (Sigma-Aldrich, St Quentin Fallavier, France) and diluted in methanol. The calibration curve was performed with Genistin, Genistein, Daidzin and Daidzein (Sigma-Aldrich, St. Louis, USA). This procedure was done in duplicate for each sample, at the initial and final fermentation time (pH=4.5) and the results were expressed in mg of isoflavone per g of dried fermented okara. The organic acids and sugar contents were analyzed by HPLC according to the method described by Zeppa et al. (21), with slight modifications. Briefly, 2 g of each sample were suspended in 10 mL of sulfuric acid 13 mM and homogenized with an Ultra-Turrax (IKA Ultra-turrax T18, Wilmington, USA) at 18.000 rpm for 3 min. Afterwards, the samples were centrifuged at 2665 x g for 10 min at 4 °C (Universal 32R; Hettich, Tuttlingen, Germany) and the supernatant was filtered with a 0.45 μm filter (Orange Scientific, Braine-l’Alleud, Belgium) before the chromatographic analysis. The HPLC system used was comprised of a LaChrom L-7100 pump (Merck-Hitachi, Düsseldorf, Germany), an ion exchange Aminex HPX-87H column (300 × 7.8 mm) (Bio-Rad, Richmond CA, USA) maintained at 60 °C (L-7350 Column Oven; LaChrom, Merck-Hitachi) and two detectors assembled in a series: a refractive index detector (L-7490 RI Detector; LaChrom, Merck-Hitachi) to determine sugars and a UV-Vis detector (L-7400 UV Detector; LaChrom, Merck-Hitachi), acquiring chromatographic data at 220 nm, to analyze organic acids. The mobile phase used was 13 mM sulphuric acid at a flow rate of 0.8 mL/min. The running time was 35 min, and the injection volume was 50 μL. The data were collected and analyzed using D-7000 Interface (LaChrom, Merck-Hitachi) and HPLC System Manager 3.1.1 software (Merck-Hitachi). For each sample of fermented okara, two samples were analyzed at the beginning and at the end of the fermentation (pH = 4.5). The scavenging activity of fermented okara (centrifuged at 20000 x g for 15 minutes) was measured using the ABTS radical cation method as described by Gião et al. (22). Briefly, 20 µl of samples were mixed with 1 ml of ABTS (with an initial absorbance, at 734 nm, of 0.700 ± 0.020). After 6 min of reaction the absorbance (734 nm) was measured using a mini UV 1240 spectrophotometer (Shimadzu, Tokyo, Japan). Each sample was analyzed in triplicate at the beginning and at the end of the fermentation (pH= 4.5). Trolox was used, as a standard, to prepare a calibration curve (0.05 - 0.2 mg/ mL) with the results being expressed in milligrams of Trolox per mL of fermented okara. The total phenolic content of fermented okara (centrifuged at 20000 x g for 15 minutes) was evaluated using the Folin-Ciocalteu method (23). The samples were previously centrifuged at 20000 x g for 15 minutes and the quantiﬁcation was carried out at 750 nm (UV mini 1240, Shimadzu, Tokyo, Japan). Total phenolic content of each sample was determined using a gallic acid standard curve (ranging from 0.025 to 0.5 mg/ mL). Each sample (at the beginning and at the end of the fermentation (pH=4.5) was analyzed in triplicate and the results expressed in milligrams of gallic acid equivalents per mL of fermented okara. Statistical analysis of data on the microbial, physical and chemical parameters of okara beverages was performed using IBM SPSS STATISTICS version 23 (SPSS Inc., Chicago, IL, USA). Normality of the data was evaluated using Shapiro-Wilk’s test. Data following a normal distribution was analyzed using T-Student or One-Way ANOVA coupled with Tukey’s post-hoc test, with the differences between means being considered significant for p-values below 0.05. When the fermentation were carried out using B. animalis ssp. 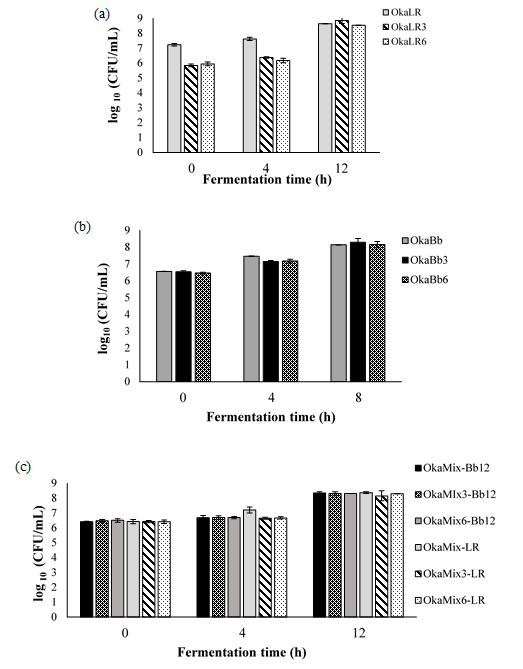 lactis Bb-12 a stronger decrease of pH values (Figure 1) and higher viable cells counts (Figure 2) were observed than when the fermentation was carried out using L. rhamnosus R11 or a combination of both microorganisms. In this study, a pH value of 4.5 was defined as the end of the fermentation process in order to avoid an over-acidification of the fermented okara beverages. However, while all okara samples supplemented with fructose and FOS exhibited a continuous decrease in pH values until reaching the target pH of 4.5, when no carbon source was added, the pH values plateaued at 6 for B. animalis ssp. lactis Bb-12 and L. rhamnosus R11 and (Fig. 1 a and b) at ca. 5 when the fermentation was carried out by both strains combined (Fig. 1 c). Figure 1. Variation of pH values of okara fermented by Lactobacillus rhamnosus R11 (OkaLR) (a), Bifidobacteriun animalis ssp. lactis Bb-12 (OkaBb) (b) or a combination of both bacteria (OkaMix) (c) at two concentrations of fructose and FOS or no carbohydrates added. OkaLR: fermented by L. rhamnosus R11 and no carbohydrates added; OkaLR3: fermented by L. rhamnosus R11 with fructose (3%) and FOS (2%); OkaLR6: fermented by L. rhamnosus R11 with fructose (6%) and FOS (2%); OkaBb: fermented by B. animalis ssp. lactis Bb-12 and no carbohydrates added; OkaBb3: fermented by B. animalis ssp. lactis Bb-12 with fructose (3%) and FOS (2%); OkaBb6: fermented by B. animalis ssp. lactis Bb-12 with fructose (6%) and FOS (2%); OkaMix: fermented by B. animalis ssp. lactis Bb-12 and L. rhamnosus R11 combined and no carbohydrates added; OkaMix3: fermented by B. animalis ssp. lactis Bb-12 and L. rhamnosus R11 combined with fructose (3%) and FOS (2%); OkaMix6: fermented by B. animalis ssp. lactis Bb-12 and L. rhamnosus R11 combined with fructose (6%) and FOS (2%). Data presented in Figure 2 (a-c) show the viable cell counts variation throughout the fermentation. It is possible to observe that the microorganism counts increased by ca. 1.5 to 3 log CFU/g from 0h to 8 or 12h. In turn, B. animalis Bb-12 and L. rhamnosus R11’s viable cells counts (after 8 or 12 h of incubation; Fig. 2 a-c) and specific growth rates (Table 1) revealed that, while there were no statistically significant differences between okara supplemented with fructose and FOS, okara supplemented with 6% fructose and 2% FOS appeared to be the best growth media among the three conditions tested. Figure 2. Total viable cells (log 10 CFU/ mL) in fermented okara by Lactobacillus rhamnosus R11 (OkaLR) (a), Bifidobacteriun animalis ssp. lactis Bb-12 (OkaBb) (b) and combination of both bacteria (OkaMix), the cells growth of Lactobacillus rhamnosus R11 (OkaMix-LR) and Bifidobacteriun animalis ssp. lactis Bb-12 (OkaMix-Bb12) (c) through the fermentation time (h). L. rhamnosus R11 count: OkaLR: fermented by L. rhamnosus R11 and no carbohydrates added; OkaLR3: fermented by L. rhamnosus R11 with fructose (3%) and FOS (2%); OkaLR6: fermented by L. rhamnosus R11 with fructose (6%) and FOS (2%); B. animalis ssp. lactis Bb-12 count: OkaBb: fermented by B. animalis ssp. lactis Bb-12 and no carbohydrates added; OkaBb3: fermented by B. animalis ssp. lactis Bb-12 with fructose (3%) and FOS (2%); OkaBb6: fermented by B. animalis ssp. lactis Bb-12 with fructose (6%) and FOS (2%); L. rhamnosus R11 count in fermented okara by co-culture: OkaMix-LR: fermented by B. animalis ssp. lactis Bb-12 and L. rhamnosus R11 combined and no carbohydrates added; OkaMix3-LR: fermented by B. animalis ssp. lactis Bb-12 and L. rhamnosus R11 combined with fructose (3%) and FOS (2%); OkaMix6-LR: fermented by B. animalis ssp. lactis Bb-12 and L. rhamnosus R11 combined with fructose (6%) and FOS (2%).B. animalis ssp. lactis Bb-12 count in fermented okara by co-culture: OkaMix-Bb-12: fermented by B. animalis ssp. lactis Bb-12 and L. rhamnosus R11 combined and no carbohydrates added; OkaMix3-Bb-12: fermented by B. animalis ssp. lactis Bb-12 and L. rhamnosus R11 combined with fructose (3%) and FOS (2%); OkaMix6-Bb12: fermented by B. animalis ssp. lactis Bb-12 and L. rhamnosus R11 combined with fructose (6%) and FOS (2%). The results of total viable cells observed for both probiotic bacteria (from 8.2 to 8.9 log CFU/mL) are comparable to those reported by other authors for soya beverages fermented by species and strains of the same bacterial groups (5,24). On the other hand, to the best of our knowledge, to date there are no data reported in the literature focusing on the use of okara to grow and fermented by probiotic bacteria. In addition, as predicted, bacteria exhibited lower (P < 0.05) specific growth rates in okara fermented than in MRS medium (Table 1): 0.84 and 0.85 h-1 for L. rhamnosus R11 and B. animalis ssp. lactis Bb-12, respectively, in monoculture fermentations while in the co-culture assay the specific growth changed between 0.58 to 0.68 h-1 for L. rhamnosus R11 and B. animalis ssp. lactis Bb-12, respectively. Regardless, fructose and FOS’s supplemented hydrolyzed okara showed to be a promising matrix for the growth of probiotic bacteria, exhibiting a µmax of 0.5 h-1 (for each strain alone) and 0.30 and 0.39 h-1, in the mixed culture, for L. rhamnosus R11 and B. animalis ssp. lactis s Bb-12, respectively. Moreover, in the present study, no viable counts of Bacillus cereus, yeasts and molds and Enterobacteriaceae were detected in the fermented okara, indicating that these preparations should be safe for human consumption, microbiologically wise. Table 1. Growth parameters of Lactobacillus rhamnosus R11, Bifidobacteriun animalis spp lactis Bb-12 and for each of the bacteria in a mixture of both. Data indicate the mean ± standard deviation of two independent experiments. Different superscript letters for the same culture are significantly different (P < 0.05). The decrease in pH values of the different fermented okara samples is related with the continuous production of organic acids that results from fermentation of carbohydrates by probiotic bacteria. The citric acid levels (Table 2) remained stable before and after okara’s fermentation regardless of the bacteria considered. For lactic and acetic acid, as could be expected, these acids were not detected in the unfermented beverage. The addition of carbon source (fructose and FOS), resulted in higher concentrations (P < 0.05) of lactic acid for all bacteria used. In addition, okara fermented by B. animalis ssp. lactis Bb 12 exhibited the highest lactic acid concentrations (8.95 ± 0.03 and 8.71 ± 0.24 mg/ mL of fermented, in OkaBb3 and OkaBb6, respectively) while, the okara fermented without carbon source exhibited values between 0.83 and 2.00 mg lactic acid/ mL of fermented okara. On the other hand, in Table 2 is possible to observe that all strains used in this study produced more acetic acid in fermented okara without carbon source and the addition of FOS and fructose results in a statistically significant decrease in the levels of acetic acid in all pure and co-culture. Moreover, the fermented okara by B. animalis ssp. lactis Bb 12 presented higher acetic acid production comparing to other fermented. In general, the metabolism of sugars by lactobacilli and bifidobacteria produces lactic and acetic acids as the major end-products, highly dependent on the strain. Consequently, the pH of the medium drops, leading to a decreased glycolytic flux and growth rate, compromising ultimately cell viability (5). In addition, the lactic acid concentrations of fermented okara reported in the present work were higher than those reported by Wang et al. (25) for a soymilk fermented by Bifidobacterium infantis, L. acidophilus and S. thermophilus (0.9 to 5.3 g of lactic acid/ mL of fermented soymilk). These differences in lactic acid production may be likely due to differences in metabolism of the probiotic strains used in these studies (5). Wang et al. (25) also reported that the lactic acid bacteria and bifidobacteria were capable of metabolizing stachyose and raffinose present in soymilk. In parallel, the ability of probiotic bacteria to ferment oligosaccharides may be an important characteristic, since the availability of carbohydrates that escape metabolism and adsorption in the small intestine have a major influence on the microflora that become established in the colon (26). Additionally, the fructooligosaccharides (FOS) are one specific group of oligosaccharides that has attracted much commercial interest and these have been self-affirmed by the manufacturers as GRAS (generally recognized as safe) and have been added to food products (such as yogurts) and food supplements (26). Moreover, in a previous study Kaplan and Hutkins et al. (26) observed that FOS utilization did not require an induction period and that FOS was equally as good substrate as glucose in supporting growth for probiotic. Furthermore, in the present study, the growth of both probiotics may also be related to the addition of FOS, as can be seen on the table 1, the okara added showed a similar growth using different fructose concentration. In addition, all fermented okara supplemented with fructose (Table 2) showed a similar behavior, with lower fructose levels in the final of fermentation (pH 4.5) than the one observed in unfermented okara. However, the fructose concentration in the fermented okara with 3% of fructose was similar (P > 0.05) to the one observed in unfermented okara. Data indicate the mean ± standard deviation of two independent experiments. OkaLR: fermented by L. rhamnosus R11 and no carbohydrates added; OkaLR3: fermented by L. rhamnosus R11 with fructose (3%) and FOS (2%); OkaLR6: fermented by L. rhamnosus R11 with fructose (6%) and FOS (2%); OkaBb: fermented by B. animalis ssp. lactis Bb-12 and no carbohydrates added; OkaBb3: fermented by B. animalis ssp. lactis Bb-12 with fructose (3%) and FOS (2%); OkaBb6: fermented by B. animalis ssp. lactis Bb-12 with fructose (6%) and FOS (2%); OkaMix: fermented by B. animalis ssp. lactis Bb-12 and L. rhamnosus R11 combined and no carbohydrates added; OkaMix3: fermented by B. animalis ssp. lactis Bb-12 and L. rhamnosus R11 combined with fructose (3%) and FOS (2%); OkaMix6: fermented by B. animalis ssp. lactis Bb-12 and L. rhamnosus R11 combined with fructose (6%) and FOS (2%). Different superscript lowercase letters in the same row are statistically different (P < 0.05), as indicated by T-test. Different superscript uppercase letters in the same column for the same culture are significantly different (P < 0.05), as indicated by Tukey’s test. Absence of superscript indicates no significant difference between samples. * Fermented okara when reached pH 4.5. The antioxidant activity, total phenolics and isoflavone contents of soy products can be affected by processes, such as microbial fermentation (5,27,28). While previous studies have shown that this process typically contributes to an increase of phenolic compounds (18,27), in this study a significant decrease in the total phenolic content and antioxidant activity was observed for most of the fermented okara (Table 3). In fact, while the total phenolic content, before fermentation, ranged from 0.18-0.25 mg of gallic acid/ mL, afterwards it ranged from 0.13 to 0.20 mg of gallic acid/ mL with the highest reduction in total phenolic content being observed for OkaLR6 (a 0.1 mg of gallic acid/mL reduction). Table 3. Total phenolic compounds and antioxidant activity (ABTS) in okara fermented in the initial time and end of each fermentation. Data indicate the mean ± standard deviation of two independent experiments. OkaLR: fermented by L. rhamnosus R11 and no carbohydrates added; OkaLR3: fermented by L. rhamnosus R11 with fructose (3%) and FOS (2%); OkaLR6: fermented by L. rhamnosus R11 with fructose (6%) and FOS (2%); OkaBb: fermented by B. animalis ssp. lactis Bb-12 and no carbohydrates added; OkaBb3: fermented by B. animalis ssp. lactis Bb-12 with fructose (3%) and FOS (2%); OkaBb6: fermented by B. animalis ssp. lactis Bb-12 with fructose (6%) and FOS (2%); OkaMix: fermented by B. animalis ssp. lactis Bb-12 and L. rhamnosus R11 combined and no carbohydrates added; OkaMix3: fermented by B. animalis ssp. lactis Bb-12 and L. rhamnosus R11 combined with fructose (3%) and FOS (2%); OkaMix6: fermented by B. animalis ssp. lactis Bb-12 and L. rhamnosus R11 combined with fructose (6%) and FOS (2%). Different superscript uppercase letters in the same column for the same culture are significantly different (P < 0.05), as indicated by Tukey’s test. Different lowercase letters in the same row for the same sample (before and after fermentation) are statistically different (P < 0.05), as indicated by t-test. In parallel, Moraes Filho et al. (24) also found a similar behavior, with a significative reduction of total phenolics during the fermentation of soymilk with okara flour by Lactobacillus acidophilus LA3 and Lactobacillus plantarum BG 112. However, in our study the total phenolics were maintained after fermentation in the fermented OkaLR3 (0.25 mg of gallic acid/ mL). The antioxidant capacity variation was similar to the one observed for the total phenolic content, i.e. the ABTS radical cation scavenging capacity of the fermented okara (0.25 - 0.04 mg Trolox /mL) was lower than that of the unfermented sample (0.49 to 0.40 mg Trolox /mL). This might be a possible consequence of the degradation of phenolic compounds that results from the metabolism of the probiotic bacteria and according to Mujić et al. (29) the content of phenolic compounds may promote antioxidant activity. Moreover, this also can be related with the conversion and final concentration of isoflavones. In a previous study, Ruiz-Larrea et al. (30) reported that genistein presented a highest antioxidant activity comparing to other isoflavones (daidzein, daidzin and genistin) utilizing ABTS method. Furthermore, several attempts have been made to improve bioavailability of isoflavone aglycones from isoflavone glycosides in soya beverage milk by fermentation with lactobacilli and bifidobacteria species and large differences in the deglycosylation ability of these bacteria have been reported by several author (5,8,28,31,32). The microorganisms used in the current work can synthesize β-glycosidase which is responsible for removing the sugar moiety from glycosylated isoflavones (5,9,18). This transformation of glycosylated isoflavones, into their respective aglycones (mainly daidzin and genistin being converted into daidzein and genistein, respectively) has been reported in soya beverages fermented using different bacterial strains and mixed cultures (5,9,32). However, although to the best of our knowledge, this was the first time that a study was performed using only okara. The results followed a similar trend, i.e. B. animalis ssp. lactis Bb-12 and L. rhamnosus R11 were capable to metabolize the glycosylated isoflavones daidzin and genistin into their aglycones. Figure 3 shows the concentration of isoflavones of all the fermented okara samples. Overall, the isoflavone aglycones’ content was higher in fermented okara samples than in the unfermented okara (initial time) (Fig. 3 a and b). Both Lactobacillus and Bifidobacterium resulted in a significant increase of the isoflavone aglycones in fermented okara. Daidzein (Fig.3 a) showed the highest increase (from 9 to 13-fold) when the okara was fermented by L. rhamnosus R11, while for genistein B. animalis Bb-12 resulted in the highest increase of aglycone form (when compared to the other fermented okara samples), with OkaBb presenting an increase of ca. 16-fold of genistein when comparing to the unfermented okara. At the same time, isoflavone glycosides’ levels were either reduced or remained constant in the fermented okara samples (Fig. 3 c and d). Overall these results show that both B. animalis ssp. lactis Bb-12 and L. rhamnosus R11 are capable of exerting an important role in the hydrolysis of isoflavones, which stands in line with previous works that described a similar isoflavones profile behavior in probiotic fermented soymilk (5,8,27), and are therefore capable of exerting an important role in the improvement of the biological activity of soymilk (9,32). Moreover, according to Gaya et al. (31), in soy beverages, these bacteria showed a higher affinity for the deglycosylation of genistin than for the other glycosylated isoflavones. This behavior differs to the one observed in okara fermented by L. rhamnosus R11wich exhibited a higher conversion of daidzin than genistin. Figure 3. 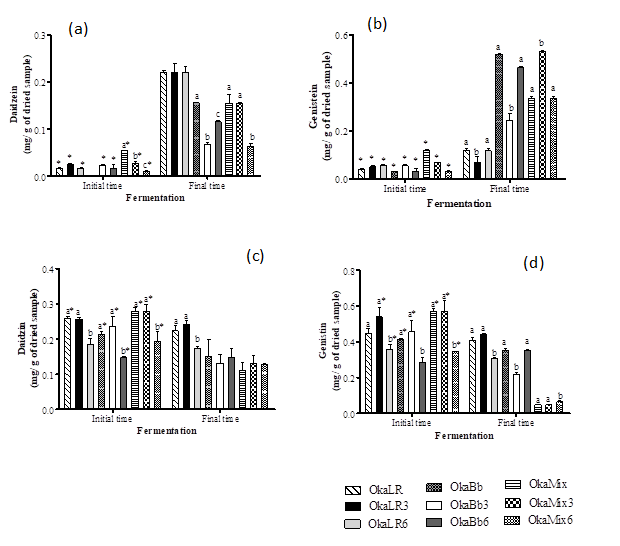 Isoflavone compounds daidzein (a), genistein (b), daidzin (c) and genistin (d) in okara unfermented and after fermentation by Bifidobacteriun animalis ssp. lactis Bb-12, Lactobacillus rhamnosus R11 and mixture of both. OkaLR: fermented by L. rhamnosus R11 and no carbohydrates added; OkaLR3: fermented by L. rhamnosus R11 with fructose (3%) and FOS (2%); OkaLR6: fermented by L. rhamnosus R11 with fructose (6%) and FOS (2%); OkaBb: fermented by B. animalis ssp. lactis Bb-12 and no carbohydrates added; OkaBb3: fermented by B. animalis ssp. lactis Bb-12 with fructose (3%) and FOS (2%); OkaBb6: fermented by B. animalis ssp. lactis Bb-12 with fructose (6%) and FOS (2%); OkaMix: fermented by B. animalis ssp. lactis Bb-12 and L. rhamnosus R11 combined and no carbohydrates added; OkaMix3: fermented by B. animalis ssp. lactis Bb-12 and L. rhamnosus R11 combined with fructose (3%) and FOS (2%); OkaMix6: fermented by B. animalis ssp. lactis Bb-12 and L. rhamnosus R11 combined with fructose (6%) and FOS (2%). Different letters are significantly different (P < 0.05) between fermented okara suing same bacteria and in the same time, as indicated by Tukey’s test. Asterisks indicate significantly different (P < 0.05), comparing initial and final time of fermentation for the same sample, as indicated by T-test. This work demonstrated that okara could be effectively fermented using Bifdobacterum animalis Bb-12, Lactobacillus rhamnosus R11 or a combination of both. However, the time required to reach a pH value of 4.5 (value at which the fermentation was interrupted) varied according to the cultures used, and the shortest acidification was observed for fermented okara by Lactobacillus rhamnosus R11without carbon source. Additionally, both the specific growth rate and acid production during okara fermentation were primarily dependent on the carbon source present although the strain used to ferment showed also to influence. Fructose and FOS addition to okara is likely to be the main reason contributing to the enhanced growth and acid production observed in the supplemented samples although a synergistic effect between the carbohydrate components and okara is still possible. This work also showed that fermented okara presented higher concentrations of isoflavone aglycones than its unfermented counterpart, which is likely to result in an enhancement of isoflavones’ bioavailability when comparing to their glycosylated forms. Therefore, the use of probiotic microorganisms to ferment okara appears to improve functional benefits for consumers through the modification of the bioavailability of the isoflavone aglycones. Furthermore, regardless of the cultures used, the higher levels of fructose (6%) combined with a fix prebiotic concentration of FOS (2%) supplementation resulted in higher specific growth rates for both bacteria than when okara was supplemented with 3% fructose and 2% FOS or not supplemented at all. Author Glenise B. Voss acknowledges Coordenação de Aperfeiçoamento de Pessoal de Nível Superior (CAPES)/Brazil, for the scholarship. This work was supported by National Funds from FCT - Fundação para a Ciência e a Tecnologia through project UID/Multi/50016/2013. NUTRE industry for providing the by-product and to Nutripar for providing the FOS used in this study. Gibson GR, Hutkins R, Sanders ME, Prescott SL, Reimer RA, Salminen SJ, et al. Expert consensus document: The International Scientific Association for Probiotics and Prebiotics (ISAPP) consensus statement on the definition and scope of prebiotics. Nature Reviews Gastroenterology and Hepatology. 2017;14(8):491–502. Miles AA, Misra SS. The estimation of the bactericidal power of the blood. Journal Hygiene. 1938;732–49. Lee HM, Lee Y. A differential medium for lactic acid-producing bacteria in a mixed culture. Journal compilation. 2008;46:676–81. Wang H, Murphy PA. Isoflavone Content in Commercial Soybean Foods. Journal of agricultural and food chemistry. 1994;42:1666–73. Zeppa G, Conterno L, Gerbi V. Determination of Organic Acids , Sugars , Diacetyl , and Acetoin in Cheese by High-Performance Liquid Chromatography. Journal Agricultural and Food Chemistry. 2001;49:2722–6. Marazza JA, Nazareno MA, de Giori GS, Garro MS. Enhancement of the antioxidant capacity of soymilk by fermentation with Lactobacillus rhamnosus. Journal of Functional Foods. 2012;4(3):594–601. Mujić I, Šertović E, Jokić S, Sarić Z, Alibabić V, Vidović S, et al. Isoflavone content and antioxidant properties of soybean seeds. Croat J Food Sci Technol. 2011;3(1):16–20. Ruiz-Larrea MB, Mohan AR, Paganga G. Antioxidant Activity of Phytoestrogenic Isoflavones. Free Rad Res. 1997;26:63–70.